As we already knew from the leaks a few days ago, the newest issue of Dengeki PlayStation magazine released this week featured some Sengoku Basara: Sanada Yukimura-den content. I have now purchased the magazine, so here's my summary. Most of the article is a recap of the information revealed last week but there's a new interview with KobaP and producer Nonaka at the end. Some of this information is very similar to what we've heard before; I've skipped the parts which were exactly the same. The first question from the interviewer asked why the staff had changed, since the team of KobaP and YamamotoD has been associated so closely with the Sengoku Basara games in the past. KobaP explained that he nominated Nonaka as producer this time; he wanted this title to be different to the previous games in the series. As for YamamotoD, his workload has become so great that it was decided that director Tanaka Toshihiro would join the project too. Of course, YamamotoD is still involved when it comes to character design, story ideas and planning out the game. Tanaka is in charge of the main story and YamamotoD is supervising. Since this is the first game which focuses on a single character, picking the title gave them some trouble. They came up with the name Retsuden Series to show that they were making a single long story focused on a single warrior. The reason Yukimura was chosen for the first game in this series is that they wanted to showcase a prominent moment in the history of the Sengoku period, like they did with the Battle of Sekigahara in Sengoku Basara 3. They settled on the Siege of Osaka. Since it's the 400th anniversary of the conflict, they thought it would be perfect to have a story with Yukimura as the lead. It's also an appropriate way to celebrate the series' tenth anniversary since Yukimura was one of the two leads in the very first game. Focusing on a single character wouldn't have been feasible if they had chosen to make Sengoku Basara 5 instead. Nonaka followed up with a longer explanation. In the main Sengoku Basara series there are many warriors, and one of the charms of the games is that each one of them can be the 'main character'. They wouldn't have been able to concentrate on a single storyline with one main character without the Retsuden Series. Not many of the warriors in the game were directly connected to the Siege of Osaka but Yukimura played a key role. They realised that by covering the story of his life they'd be able to delve deeply into the Siege of Osaka. KobaP would be delighted if people could pay close attention to the bonds between Yukimura and his older brother, and between Yukimura and his father. He hopes the fans will try to come up with their own theories based on historical records while they wait for further information. Since the story draws from actual history, some character relationships and backgrounds will be a little different this time. In some cases, characters who know each other in the main Sengoku Basara games didn't interact historically. As a result their relationships have been altered for this game. KobaP elaborated further; games like Sengoku Basara 4 Sumeragi are essentially 'what if?' scenarios. Since this game isn't like that, it's tough for them to include characters who weren't involved historically. They don't want to go against established history so they reluctantly decided that some characters wouldn't be appearing at all. The interviewer asked about Sasuke, noting that he has a deep relationship with Yukimura in the series despite being a fictitious character. KobaP refused to answer, saying it was still a secret at this point. Instead, he mentioned that Shingen and Yukimura's interactions were the same kind of thing, 'what if?' scenarios rather than historical events. Since Yukimura's father and older brother are appearing this time, Yukimura's position has changed with regards to Shingen. These examples show that the world of Sanada Yukimura-den is different, with its own characteristics. However, the new continuity won't affect the personalities of the existing Sengoku Basara characters who appear in the game. Some relationships have changed, but don't worry, the warriors' individual personalities and voice actors haven't. The new trailer (from Jump Festa) is going to appear on the game's official website on Christmas Eve. In the trailer, Yukimura is shown as he faces his final battle - the Osaka Summer Siege. In the actual game, he gradually matures into the 'unprecedented' Yukimura shown in the video. Nonaka wanted to show Yukimura growing over the course of the game, so his appearance and weapons become flashier over time. Yukimura's association with fire is strong so the flame imagery is at the forefront. KobaP noted that he has more aerial moves this time. It's a good match for the phoenix imagery on his new outfit. We can look forward to a story which has both Yukimura-style hot-blooded content and serious moments. Masamune uses his six-claw style all the time in this game. We can expect new moves which make use of the six swords. Since this is a new game, there are new gameplay elements. But we have to wait for further details. Nonaka said that there are also new elements to keep people coming back and playing after they complete the main story. KobaP added that there's only one story so to keep people wanting to play, they've included all kinds of Basara-ish things. The stages have been put together especially for this game so they're different to before, and the stages have different win conditions. They can't say more for now. However, the difficulty level hasn't changed. It's possible to play in a relaxed way as usual, sitting back and enjoying the solemn story. People who want more of a challenge can select a higher difficulty. It's appeared in previous games but since Osaka Castle is the climax of the game, it's a completely new stage this time around. KobaP joked that this Osaka Castle looks very flashy from outside. Although Tokugawa Ieyasu was an old man by the time of the Osaka Summer Siege in real life, they haven't retained that element in the game (lol). Please expect all of the returning Sengoku Basara characters to look the same as usual. Nonaka wants to surpass the fans' expectations when it comes to making the characters stronger, but he doesn't think there's any need to change their core character concepts. So there won't be any dramatic alterations like changing their ages. Nonaka thinks there are many characters in the series who would work as a lead in a future Retsuden Series game. If it was his decision, he'd like to make a game about Xavi! Honda Tadakatsu would also make an interesting lead for a future title. KobaP thinks that they'll end the Retsuden Series if it isn't well received. Even though he's a little nervous, he's really looking forward to hearing what fans think about it. His heart is pounding because it's a new experiment! Raindrops' note: I said that Nonaka was the director last time, rather than the producer. This was a mistake on my part due to overexcitement, he's definitely the producer. Sorry. It's not even written in Japanese. 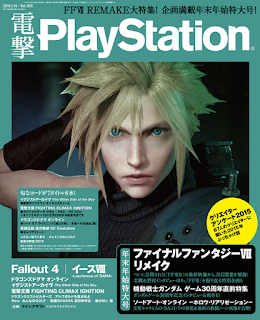 I didn't spot anything new from Weekly Famitsu in this week's bumper year-end issue. That fits the pattern they have used in the past, though, where Weekly Famitsu breaks the news one week then Dengeki PlayStation (which is on a fortnightly schedule) adds a few more details while Weekly Famitsu concentrates on other titles. As per KobaP's comments, the game's official website will update tonight and add the video from Jump Festa. I'll add the direct link to this post when I wake up. What a great Christmas gift! Edit: The video went online at 10:00 Japan time! You can watch it on the official YouTube channel. ****, now I want that game about Xavi too. What've you done Nonaka-san! I've lucked out that my fave character got a spin-off, but I guess if they continue these spin-offs I could try to check them out. IMO Sasuke *should* be in this game, especially if Yukimura's relationship with Shingen isn't going to be as close (I assume that's the thing that get changed). Even if Koba wants gamers to appreciate his relationship with his brother and father, a familiar character that's still in a familiar relationship would be easier to relate to. But again, I'm hoping the game length will be decent. How many stages would realistically be in this game if it's just based on character interactions? Said it before, I'll say it again- I really don't get how they could do a Xavi retsuden. He was only in Japan for 3 years and was a pacifist in real life. Unless they would extend it by making it a Sorin retsuden too or making him like a stand-in for Frois or another later Jesuit. Don't get me wrong, I'd love a Xavi game... it's just with how many changes they're suggesting for Yukimura alone to make the game have more historic value, I'm not sure Xavi is the best choice lest they eschew the whole "let's follow history as closely as possible" thing. Only problem with first Ueda is that Yukimura was hostage of the Uesugi at that time, hence why he didn't fight there. The Sanada likely would not have beaten the Tokugawa without the assistance of Kagekatsu's forces. Yet, we have no Kagekatsu. So this leaves us with three options (in the end all with Yukimura helping his father and brother by virtue of the Uesugi being there so he'd come along): 1) They're gonna make Kagekatsu; 2) They're going to have Kenshin stand in for Kagekatsu; 3) No Uesugi, no Yukimura being hostage, just hyping up the Sanada... which would be really weird if they're going the "historical" route. I guess they could try to make Kanetsugu a serious character too but I just don't see that happening. Then we have to consider Masamune too. It isn't his story, but how much of him will we get? Will we get to see any of his endeavors against Yoshiaki or Satake? Or will our first meeting with him be at Odawara along with Yukimura? Even though, of course, historically, Yukimura was not at Odawara or if he was his significance was only such that he wasn't noted as being in his father's army. I mean, Masamune still being Yukimura's rival is proof they are willing to stretch the truth a bit- besides their forces (not even they themselves) skirmishing at Osaka, they didn't ever meet historically to our knowledge. Then as we get to Sekigahara, how are they going to handle that whole mess? With the absence (assumed absence anyway) of Inahime/Komatsuhime, what real motivation would Nobuyuki have to not stay with his family when they defect to the West? Will Ieyasu lead the attack on Ueda, or will Nobuyuki work alone? Hidetada isn't an option as they aren't aging up Ieyasu again. Will we see Masamune actually helping his uncle at Hasedo, in spite of backing off after initial strikes? Osaka, on the other hand, seems fairly straightforward. Yukimura arrives to defend Hideyori (who can easily be offscreen), and has several stages throughout the Winter and Summer sieges, culminating in his final battle against the main Tokugawa army going out in a blaze of glory. Matabei seems an obvious ally who'd show up here, too, given Osaka is also his claim to fame. Then Masamune has a battle or two there as well... Of course, Tadakatsu's absence with Tokugawa being all alone would be odd, so I wonder if they'll just magic him to be alive anyway. I'm just really curious how they're going to handle everything- what parts they're going to concede on to make a better story or who they'll include to stand in for their less famous heirs and the like. I have to express my opinion here about several things yo said. 1) I see very improbable that Shingen and Yukimura ever meet in this game: the historical Shingen died when Yukimura was 1 year old. But, Sanada Masayuki could replace Shingen in that aspect. Instead of "Oyakata-sama! Yukimura!" we can easily get a "Chichi-ue-sama! Yukimura! ", since Masayuki himself was a bit weird as a mentor, or at least that I have read before. 2) Apparently, Yukimura DID fought in the first Battle of Ueda, not only the second one. Yes, he was a hostage of Uesugi forces (by the way, I think it's more probable to have Kenshin act the role of Kagekatsu here) in that time. But, it is also said that the Uesugi gave permission to Yukimura to fight with the Sanada at the time of the battle. In fact, the reason Yukimura went as hostage to Uesugi, was for receive support from the Uesugi to fight Tokugawa in the first Battle of Ueda. So, the first Battle of Ueda seem too probable. 4) In the Battle of Sekigahara, Masamune was fighting Uesugi Kagekatsu and Naoe Kanetsugu forces, so Ieyasu could come to Sekigahara. And, hey, if Yukimura get his dad and older brother in this game, why it's improbable to see Hidetada here? That producers won't change age doesn't mean they can't add other characters, age apart. Ieyasu can mantain the same age AND have his son Hidetada. It's a Sengoku BASARA game after all, I can't see them eliminating all the funny and exaggerated parts. 6) Siege of Osaka was a very complex battle. Or I should say, a very complex war with several battles, specially Summer Siege. I don't think they would have only one Siege of Osaka stage, at least they should make two (and that's too few). 7) Masamune and Yukimura DID fought against each other: it was in the Battle of Doumyouji, the battle before the Battle of Tennouji (the last one of Siege of Osaka: Summer Siege). And in that single battle, Yukimura and Masamune really got respect one from other. Probably, as you said, they could meet before in Odawara. Yes, there's no proof that Yukimura (or I should said the Sanada clan) fought in Odawara, but there's either no proof that Sanada clan didn`t participate in that siege, right? 8) Expect Tadakatsu be there in Osaka. Kojuurou too. Not only Matabei would be obvious, also Mouri and Chousokabe (Katsunaga and Morichika at least, Motonari and Motochika were already dead at this point, but if Uesugi Kenshin would appear instead of Kagekatsu, it is likely for them to appear here too). Also Shimazu Yoshihiro can be here (it was someone from the Shimazu clan who considered Yukimura "The Greatest Warrior of Japan (Nippon Ichi no Tsuwamono)" anyway), and Muneshige, but sadly with the Tokugawa (after Sekigahara, they didn't have another option than ally with the East, since the West they fought for lose that battle). Well, that's all my guesses. Once more, Excuse me if my English is weird, since that's not my native tongue (I'm from Central America, so I speak Spanish, and Japanese is a bit easier for me than English, so...). 1) Yukimura as a hostage, received training with the yari. I expect to see that training in the game. 2) I would expect Sasuke will be here too, although it's only a legend, there's no proof that Sasuke existed. But I can't imagine BASARA Yukimura without Sasuke. And it would be awesome if producers add other Sanada Ten Braves besides Sasuke, specially Kirigakure Saizou. I don't think they could add all Ten Braves, but at least it would be great if Saizou appear too. Yes, that's all for now. By the way, the video is AWESOME!! I probably seemed like Po from Kung Fu Panda fanboying over the Furious Five when I saw this video XD XD XD I expect fans could appreciate this experiment, it could lead to other funny Retsuden series (I really want to see one about Shimazu Yoshihiro and Tachibana Muneshige together, their real histories were great!). PV1 is up on japanese PSN (in case if someone interested).